With Zapier you can easily connect LiveChat to multiple services that allow you to store chat transcripts, create new contacts in your CRM and much more. Zapier is a tool that connects apps and makes automation of tedious tasks easy. Most modern web solutions have an Application Program Interface (API), which developers can use to interact with. They can do things like upload information, send email, move a customer from one email list to another or remind about payments through SMS. Zapier acts as a middleman for APIs. It connects all your marketing tools to make your job easier and your campaigns smarter. You just choose trigger and set up a reaction. Let's assume that your customer didn't pay for your business services - this is a trigger. Then your mail service gets the email of this customer from Zapier and automatically send the reminder - this is the reaction. You can now use LiveChat as a trigger app in Zapier, integrating your chat with almost every software on the planet. Use this opportunity to automate your workflow even more, in ways you have never imagined. With this integration, you can move chat data from LiveChat other apps and services without any copy or paste needed. Combine LiveChat with a range of popular apps and services using Zapier - no coding needed! Competitive advantage can be obtained by managing your products more efficiently and having good relationships with customers. With over 750+ apps on Zapier, you can LiveChat with just about anything that you’re already using. 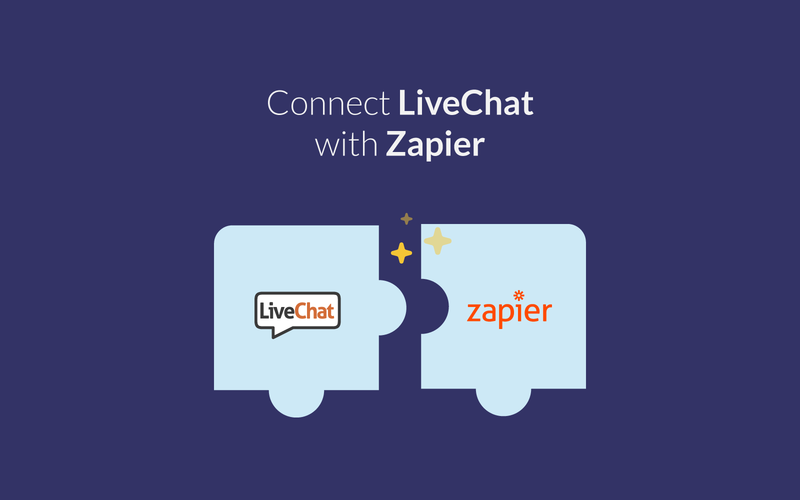 Start using LiveChat with Zapier now!